Microsoft says that Win10 version 1903 will be in beta preview for a while, then pushed out to normal people in late May. That makes now a good time to store away a clean copy of Win10 1809. Even if you never use it, doesn’t hurt to hold onto it. Stick it on a little-used hard drive, or a USB stick. No need to do anything fancy – you may never want it – but for now the bits are free and clean. Step 3. Click Run (or if it’s downloaded, double-click on MediaCreationTool1809.exe). Step 5. Choose the radio button Create installation media (USB flash drive, DVD, or ISO file) for another PC then click Next. Step 6. Use the recommended options for your current PC or, if you must, changed the Language or bittedness. Click Next. Step 7. Click the ISO file radio button and click Next. Step 8. Choose a location for the downloaded files and click Save. Step 9. Wait. If you’re on a fiber optic line it’ll take a few minutes. If you’re on a lousy landline, it could take years. You can use your PC while you’re waiting. Watch grass grow. Count gigaflops. Go out and enjoy the weather and wonder at why you’re cooped up front of a PC on a day like this. 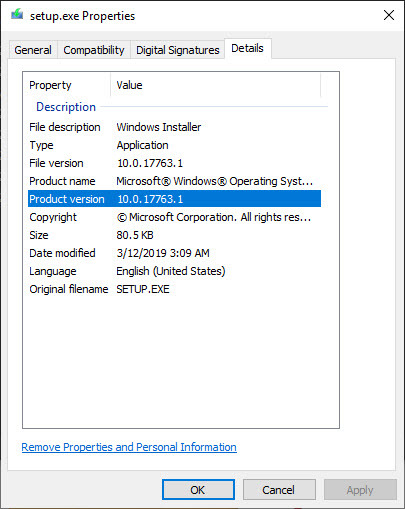 If you want to verify the version number, double-click on the ISO file, right click on Setup.exe, choose Properties, and look on the Details tab. If you want to create installation media for Win10 1809 – a USB drive or DVD disc that you can use to boot and install Win10 1809 – follow the instructions here under the heading Using the tool to create installation media (USB flash drive, DVD, or ISO file) to install Windows 10 on a different PC. It basically takes you through the same steps, but has you veer off into the bushes in Step 7.